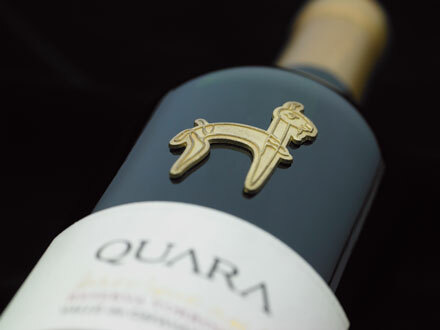 Including metal labels or embellishments are ways of conveying a sense of luxury to wine consumers. Star packaging designers who addressed Wines & Vines’ second annual packaging conference in August 2015 seemed to agree: The North American wine industry tends to be extremely conservative about adopting novel packaging designs and solutions. For a business that is inherently creative (a new vintage every year, farming and legal challenges, shifting market strategies), this might seem off-kilter. On the other hand, the New World’s belated embrace of wine as a mass-market beverage—and the practicalities of retail display and home storage—do, in some ways, mandate conservative decisions. Even if it might stand out, few dare try to sell a wine that won’t fit on shelves and wine racks. On-premise sales are often ignored in the design process. Specialists in winery packaging are sometimes frustrated when conservative clients reject their most original ideas. Despite continuing strides in materials and techniques, costs and timing can inhibit commercial adoption of new approaches to packaging. Many wineries start with a concept resembling other packages. This is not a good idea: Be authentic to yourself and your brand. Buttita’s Rosa d’Oro brand produces some 2,000 cases annually in the Kelseyville Bench appellation of Lake County, Calif., giving him first-hand understanding of marketing boutique wines. “Small producers are often not so great with general brand design and integrating website, packaging, print collateral, etc., in a meaningful way. With the plethora of brands out there, there really isn’t much reason to assume that anyone is unique, or that ‘small, family-owned’ means anything,” he said. “Label design seems like a burden to many small producers, the last thing they want to think about. Or it is outsourced and clearly unconnected. I encourage small wineries to think of it the opposite way, as chefs think of their menus. “The bottle is the primary document, and though dialing it in is a long process I feel that grower/producers (whom I prefer to work with) need to think of it as the executive summary of their business plan—that icing on the cake. Especially when you only have a few hundred cases, keep it meaningful and personal. So many bottles out there lack integrity, like a menu that doesn’t deliver or transparently convey the experience to come. Even small labels spend a lot of time guessing what the consumer wants, rather than focusing on the nature of their product,” he said. For Rosa d’Oro, Buttita worked with Kerri Green Design of Oakland, Calif., to draw heavily on Old World southern Italian packaging for the style. This, Buttita said, “Gives it a sense of location in time and place using screen-print bottles that work with our limited bottling space. The wine was not made in an international style, so hopefully the packaging reflects the style markers to some extent,” he said. Doubleknot generates ideas from diverse sources ranging from fashion trends to street art, auto design to sports apparel, from local to international graphic design, and from historic architecture to artist forums, Carey said. He predicts that the North American industry will see more innovation in the inks, paper, substrates and the merging of different applications. For example: resin labels, silkscreen and paper, unusual wraps, unique neck and closure solutions. Wineries may still resist these evolutions if they look too contrived. The walk down memory lane sparked ideas for future brand and marketing concepts, but since they are still in the hopper, “We don’t want to give them away,” she said. Nelson and her team are inspired by available materials and packaging elements. “We like the German Kefla-Glas bottles and would love to design packaging using their glass. Unfortunately, most of their bottles are non-standard in size, which creates an expensive problem when trying to find secondary cartons and shippers. We also understand that wine shops and restaurants aren’t set up to store them,” Nelson said. Basel Cellars Estate Winery, a 7,500-case producer in Walla Walla, Wash., uses a hand-stained metal label on its top-tier package, complementing a wax dip seal on a screen-printed bottle. Its house wine features a door lock sourced in China slung around the paper-labeled bottle. “Deborah Barnard, of Barnard-Griffin Winery in Richland, Wash., is an accomplished glass artist. Her glass studio is located inside the winery,” Nelson said. Sara Nelson Designs proposed that the winery create an “Artist Series” package featuring quarter-size nuggets of Deborah’s glass art adhered to screen-printed bottles. Additionally, “We’ve proposed military-like embroidered patches in place of a paper label. Nelson said her team draws inspiration from its Pinterest account. “We follow the Dieline and watch to see what other designers are doing. But when we look back over the design concepts we have offered up, inspiration typically comes from the client’s story and situation. A similar evolution drove packaging for 2,000-case Wm. Grassie Wine Estates in Woodinville, Wash. “He thought he wanted a ‘chateau’ label, but when the client’s name is Grassie and he’s a master gardener, inspiration comes easy,” Nelson recalled. “I can’t tell you how often new clients tell us they want a ‘chateau-esque’ wine label. They want a pencil illustration in the background—often of their building, which is never a chateau, or their vineyard)—and a hard-to-read script for their brand name. They think they want a European feel,” she said. “The reality is that they sell their wines in the United States, where wine labels are colorful, memorable and generally well-designed. The beige-on-beige, chateau-style label they desire will be nearly invisible on a shelf next to others in the same category,” Nelson advised. “We hear a lot of ‘We want to look like’ when we start with clients. While that’s helpful in getting to know their dream and their taste, we want them to have their own unique, memorable brand. The most receptive clients are fairly small and well-funded,” Nelson concluded. TricorBraun provides bottles and other services to the wine industry. Based in St. Louis, Mo., Mike Murphy heads its design group, which works on both plastic and glass containers. According to Suzanne Gordon, regional sales manager in Santa Rosa, Calif., TricorBraun created AVA-specific bottles for Ballard Canyon on California’s Central Coast. “Several wineries are using it. The bottle has an embossed cartouche; readying it does not take long,” she said. The designers had to modify the package to accommodate different labels. Numerous wine producers have adopted the bottle, and it’s practical for those producing as few as 1,500 cases. “As with other cartouches, the label needs to fit below,” Gordon noted. Oregon’s Yamhill/Carlton AVA also has a TricorBraun bottle. The AVA-specific bottles are not mandatory, although the organizations must coordinate and agree on the shape, Gordon said. “Being innovative is a hard sell. As (winemaker) Jean Charles Boisset says, ‘The egg is the perfect package.’” To our knowledge, wine is not yet available in an egg (or an egg-shaped package), so there is still opportunity to improve on perfection.